Mayday Rescue - Apco Aviation Ltd.
Mayday rescue May 19, 2003 – sunny, cool Canadian Spring day. Nice flying conditions We are used to receiving many reports of life-saving Mayday deployments in emergency situations, as there are quite a few Maydays in pilots harnesses by now. However having Mayday 18 safely bringing down 2 pilots is a rare occurrence and we felt the need to share it with you and your readers. Chris Muller’s girlfriend, Jackie, was flying Fiesta with Silhouette harness and Mayday 18 emergency parachute. It was a crowded day and a guest Swiss pilot, unfamiliar with site rules, collided mid-air with Jackie. Both pilots lost control of their gliders and the lines became entangled. 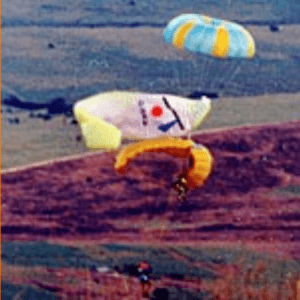 The Swiss pilot could not find the handle of his emergency chute, so when Jackie deployed her Mayday 18, both pilots descended safely riding the one Mayday 18. Neither pilot suffered injury and the incident ended happily with only a few bruises and scratches – shaken, but safe. Even more incredibly, we received reports from a number of witnesses of an incident which occurred in Oludeniz, Turkey. Two Tandem pilots, flying with passengers had a mid-air and as a result 4 people descended to safety on one Mayday emergency parachute! WOW ! ! ! ! 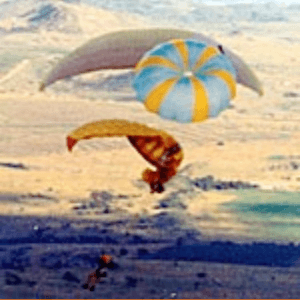 I believe these incidents are quite unique and prove the necessity and efficiency of emergency parachutes and underline the importance of having one. I ordered some lines & risers for a Fiesta XS today. They were damaged during a ‘mid-air’ and reserve deployment yesterday. the pilot was Jackie, Chris’ girlfriend. it was her first thermal flight. Jackie is bruised and sore, but ok. As she was flying with a Silhouette Airbag & Mayday 18, I thought you might like to read a report from a spectator. Bruce Busby is a hang glider pilot with a little paragliding experience. last year he tumbled his hang glider and deployed so his observations are quite accurate. My observations of Monday’s excitement From: Bruce Busby Comments Hi all what an exciting Monday!!! You Paraglider pilots really know how get a crowd on their feet. (I wasn’t flying my HG or PG yesterday so I can say that!). 1st we had a Mid Air with Jackie and a foreign pilot. Jackie got her chute out with authority while the other pilot couldn’t find his deployment handle!!! Both were uninjured. Here’s my pilot’s observation on a few situations. Before anyone thinks I’m climbing up on my soapbox… you should know: I fly Hang Gliders and Paragliders. I’m a certified HG instructor and last year I threw my reserve after tumbling my Hang Glider in Chelan Washington. Mid-Air: In my opinion, the sky was nearly empty, that mid air should have never occurred. Jackie was thermaling and climbing and seemed crowded by the other pilot. Pilots should leave a few gliders difference in height and 30-40 seconds in horizontal space to react to an un-expected turn or a collapse/recovery. The second pilot should have turned away and rejoined Jackie after she had a few more turns to climb out. Again, only my opinion. I was not intently watching the preclude to mid-air. I was however, intently watching after the mid air. Seeing that chute deploy was a great relief. Secondly in the mid-air the second pilot reported being unable to find his reserve handle and therefore was unable to deploy. WHAT??? Couldn’t find his chute??? WHAT??? Know where your handle is with you eyes closed! Reach for it at least once in each flight, look at it before launching and while flying. He may well owe his life to the deployment of Jackie’s chute. Had he not been tangled in her lines, he might have been very seriously hurt. Good throw Jackie! That chute came straight out! Trust me, on this. I knew where mine was and I didn’t see it before I had it out of my harness and in my hand. didn’t see it before I had it out of my harness and in my hand. I hope we all learn something from this. I hope the pilots contribute to this discussion so we can learn even more about what they experienced. Best of luck this week to all pilots, fly safe and have fun. Remember your skills may be rusty but the thermals this time of year are ripping. As one of my fellow Hang Gliding competitors said last week, Launching is optional, Landing is Mandatory. We did have another report of a similar incident 9 years ago when a mid-air accident in South Africa ended up with 2 pilots riding a single Mayday to safety, escaping any injury on landing. back to top back to letters from saved pilots.